I can’t believe we are in the middle of December and there hasn’t been any snow yet?! However, that doesn’t mean to put all your horse’s winter gear into storage and bring out the suntan lotion! Snow may be just around the corner. On the bright side, since the weather is still relatively warm, now is the perfect time to prepare for the colder weather (if you haven’t already). Horses don’t quite go into hibernation like bears, but they do need consume a lot more calories per day during the winter. I always try to convince my human friends to bake me some of those scrumptious holiday treats (Stay tuned for my next blog post!). Unfortunately, they tell me it’s not HOW MANY calories but from WHERE the calories are coming. Increasing hay is very important during the winter because hay ferments inside the body and produces heat to keep horses warm. For every degree the temperature drops below a horse’s critical temperature, its hay consumption must be increased by 1%. A horse’s critical temperature is determined when they burn more calories to maintain body warmth than their normal expenditure. This can happen when the outside temperature is between 30-50 degrees F (it depends on the horse. This means if your horse’s critical temperature is 40 degrees and the outside temperature is 35 degrees F, you must increase the amount of hay by 5%. Some signs to watch for if your horse has reached this point is when the hair coat is standing on end instead of lying flat, shivering, horses seeking shelter, or losing weight. It is also very important to make sure your horse always has access to UNFROZEN water. Heated waterers work the best, but they should be checked everyday just in case they freeze. With the increased hay consumption, your horse can be more susceptible to colic, especially with decreased water intake. Some good tricks to getting your horses to drink are soaking a pelleted concentrate, hay cubes, or beet pulp in two gallons of warm water. Click here for more tips on winter feeding. Another option to keep your horses nice and toasty is by blanketing when their winter coat is not enough. Some horses have more or less hair, and warmth also depends on the horse’s fat layer. See – having a little extra fat can be a GOOD thing! Pass the doughnuts! 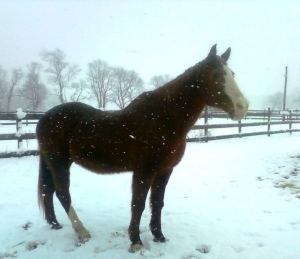 Most horses tolerate the cold weather very well – it’s the cold, RAINY weather that chills them to the bone. BRRRRR! Remember that the best thing to do is use nature’s blanket by letting your horse grow its natural winter coat. Most horses do not need to be blanketed at all. Your horse will let you know if it’s cold. 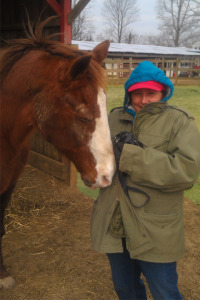 If you see horses shivering you know that they need to be blanketed or brought into a warmer environment. In determining what blanket to choose, consider where your horse will be primarily housed during the winter months. Then assess its body condition score (BCS). Horses with a BCS of 1-5 will need to be blanketed sooner than a horse scoring 6-9. For more information check the Equine Science Center’s fact sheet on To Blanket or Not to Blanket? The Equine Science Center is a great source for tips, tricks, and truths about winter care for your horses this season. Think of it as an early gift to you from the Center! Have a very happy holiday season and make sure to spend lots of time with your friends, family and horses!